Groveston featured on Feb. 2 edition of "Hollywood Game Night"
Alicia Groveston knows lacrosse. Alicia Groveston knows pop culture. Grand Valley State faithful have seen Groveston’s lacrosse coaching prowess over the past four seasons, in which the Lakers have posted a 51-21 record under her lead. GVSU faithful will get a chance to see Groveston’s pop culture prowess on Feb. 2 at 8 p.m. on NBC, where she will be a contestant on "Hollywood Game Night" – a primetime game show. Last September, Groveston applied to be a contestant on "Hollywood Game Night," one of her favorite game shows. A self-proclaimed pop culture lover, Groveston was selected to be on the show, and headed to Los Angeles in late October to film her episode. "Hollywood Game Night," which is in its fourth season, is hosted by actress Jane Lynch, and pits two teams of four against each other. Each team features three celebrities and one contestant, and a prize of $25,000 is available for the civilian winner of each show. Though Groveston’s episode will air on Feb. 2, she knew she would be a contestant on the show since October 2015. She was told her episode would likely air around the same time as the Super Bowl, but was under a contract regarding how much information she could divulge to those outside the show prior to her episode. Picking a favorite show isn’t an easy task for the Laker head coach, but the ABC Thursday night lineup suits her just fine. "Grey’s Anatomy", "Scandal" and "How to Get Away with Murder" are some of the more popular options, and some of Groveston’s favorites, but lesser-known titles like Lifetime’s "Pitch Slapped," a show about high school a cappella groups, also suit her interests. Greatness, in any arena, comes with a deeper-than-normal knowledge of the topic at hand, and Groveston’s shot at "Hollywood Game Night" proves her pop culture talent. 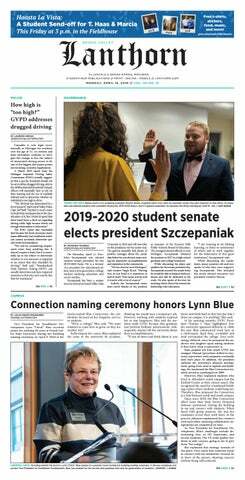 Though the network dictates a strict dress code for contestants, Groveston was able to slip in some love for GVSU by wearing Laker Blue and donning a women’s lacrosse championship ring. Groveston’s confidence on the lacrosse field is apparent, as her teams have won every GLIAC title in the history of the conference. As far as her pop culture abilities, Groveston is similarly confident, as she had a shot to be on the show previously, but had to pull out of consideration. “I’d gone through the process once before and I didn’t feel comfortable ditching my (team) for glory, so I stopped the process,” she said. Fans of both GVSU and game shows will have to wait until Feb. 2 at 8 p.m. to find out how Groveston fared, but for her, the experience topped any sort of outcome. “It’s been super surreal to know this is coming and now it’s here,” she said. “I’m so excited to share the experience with everybody. It was fun to keep it secret, but now I want to tell so much more. I want people to be able to experience it.